The demand for marketplace business has increased in recent time. Marketplace opens a wide range of options for customers to choose and business is done in a more transparent manner. Online Marketplaces have made a big impact on the travel industry as well. Digitalization has played a vital role in the way marketplaces have evolved in recent times. 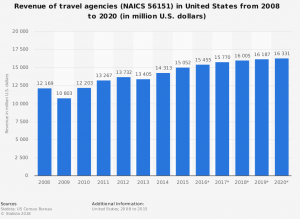 According to statista , digital travel sales in the United States are expected to reach 817.54 million dollars by the year 2020. The advancement in technology and people preference for convenience has given birth to different business ideas in which anyone can start a profitable travel marketplace. When it comes to online tour booking marketplaces names likes Tourradar and Yatra come first. In these websites, a visitor can find various travel packages listed by different travel agents. The travel packages consist of flights, accommodation, and holiday trips etc. Travelers can compare the packages and buy the one which suits them the best. The admin of these websites can earn money through commission on each booking and advertisement. Companies are generating high revenue in this form of the travel business. According to stats, Yatra.com reported having USD 31.7 million revenue in the year 2018. It is one of the highly profitable business ideas and aspiring entrepreneurs can consider launching a tour booking marketplace. There is a number of things required to build an online tour booking marketplace. You can consult with a reputed and experienced web design development company to build such a website and apps. People these days want to know each and every information in advance before traveling to any place. This has led to the demand for online travel discussion platforms. Trip advisor is a well-known online travel discussion platform generating the revenue of 308 million U.S. dollars in the year 2018. The platform allows travelers for discussing current travel advisories and alerts regarding any hotel or travel location. The platform is not limited to just discussion visitors can also read the reviews of other travelers and know about their experiences on visiting those venues. The website owner can earn from the subscription packages hotels and advertisement. Airbnb is the biggest name in the business when it comes to short term rentals for vacations. These days’ people going for vacations prefer staying in condos or apartments rather than hotels. As these vacation rental offer better amenities and size of the accommodation is much larger as compared to hotels. Renting condos or apartments is also a cheaper option as compared to hotels. Websites such as HomeAway, VRBO, Airbnb are leading vacation rentals marketplaces where owners can list their apartments for booking. Visitors can search the apartments for the desired location and check complete details like cost of renting, size of the apartment etc. The owner of the website can earn revenue by the commission on each booking from the website and advertisement. In last year’s report, researchers expected Airbnb to generate approximately 155 million room nights in 2018 in the U.S. and Europe, an increase of 14 percent over 2017. So this business model has huge potential and you can become the next Airbnb or Vrbo in your region by launching a vacation rental booking marketplace. Gone are those days when people are seeking for sightseeing during vacations. Nowadays, people prefer doing various kinds of adventure activities which makes online travel activity business the biggest force in the online travel industry. According to stats, adventure tourism compound rate will grow 45.99% by 2020. Names like Get Your Guide, Viator are top players in online adventure activity booking business. As adventure activities mostly happen in areas far from the city so these marketplaces help visitors to make contact with listed activity hosts very easily and make bookings for their desired adventure activity in advance. The craze of adventure activities makes it a profitable business idea in the travel business. The best thing is that to start a travel activity marketplace, you don’t need to pay thousands of dollars. With a turnkey travel activity platform like FunAway, you can launch a fully-fledged travel activity marketplace in a few days. There is no doubt that the travel industry is growing at rapid pace. Hence, all the aspiring entrepreneurs looking to start a travel business can choose any business idea from listed above according to the demands and needs of their business.